When tying flies it's the small details that make the biggest differences - one such detail is adding weight to the fly. Have you ever considered if, how and why you add weight to your flies? I add weight for a number of reasons! First of all, I like fishing with floating and intermediate lines but hate when the fly skids on the surface. I want it to get down and start swimming instantly. I also think it's easier to perform a nice cast when the fly is weighted. There are many ways to achieve this but from my point of view the FutureFly Tungsten Body is by far the easiest and best way of doing it. The FutureFly Flexible-Tungsten Body product is not just a simple weight! It also gives the fly balance in the water. It's meant to be tied in under the body of the fly and the consequence is obvious! 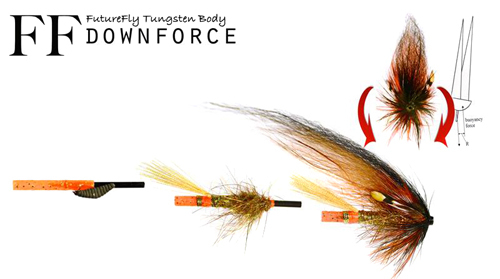 The tungsten body will have great impact on how the fly moves in the water. Most importantly is that both you and the fly will keep on an even keel. In Sweden we call this rig a 'tungsten cradle' and the description of a cradle is very suitable because the fly always gets back to an upright position like we want it to be in. When we tie flies we have a vision of how we want the fish to see it, don't we? The FutureFly Tungsten Body will, for sure, help you create flies made for fishing and that's what it's all about, isn't it?